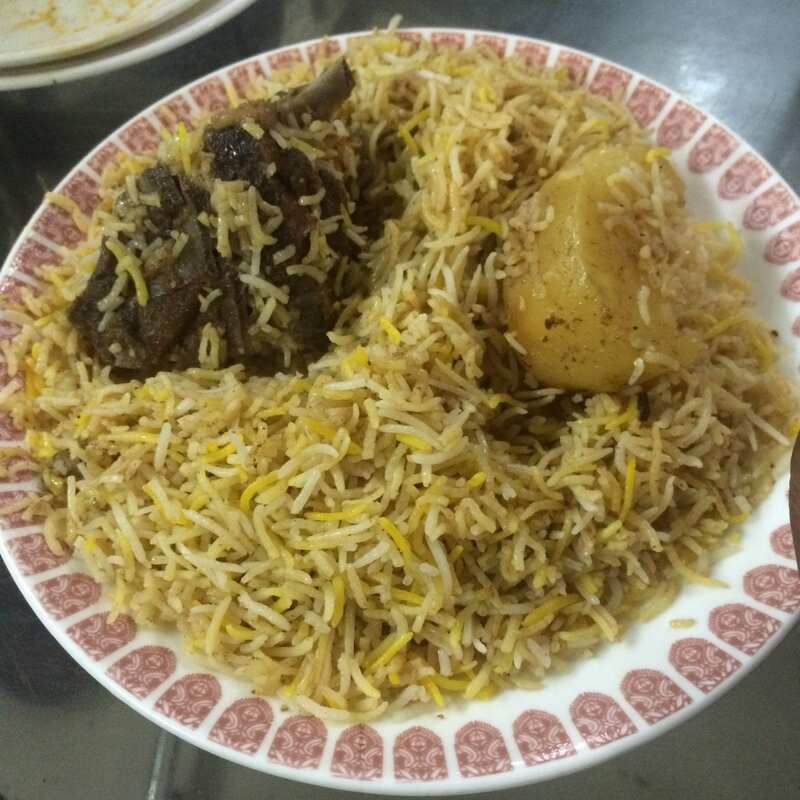 Kolkata is THE mecca for biryani lovers. There are branded biryani joints (some of them discussed here) and then there are those lone warriors in this segment, who, over the time, has stood up to their forte. Firstly, let me start with the non-foodie area (so called) in Kolkata- the new town, rajarhat. While driving from nicco park, once you cross this small bridge and on your left, you’ll fine this huge DLF IT park- 1. It’s impossible to miss the huge structure. 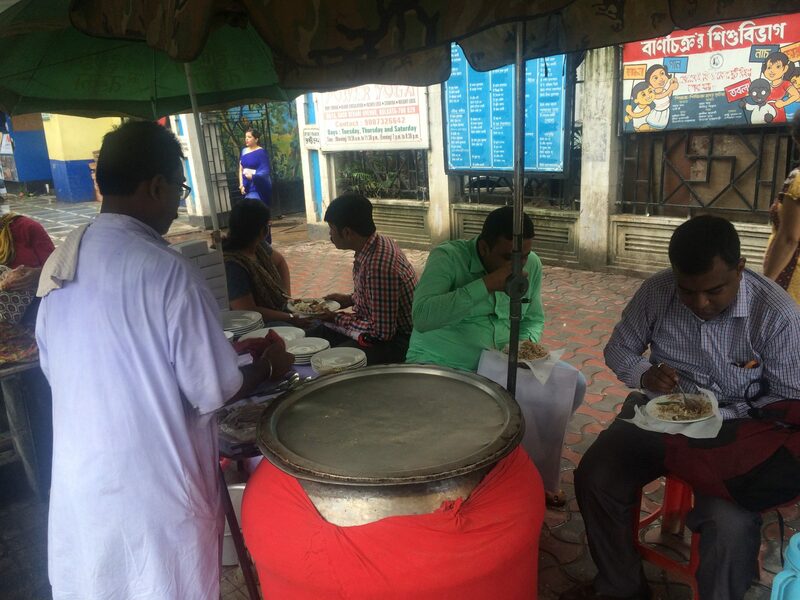 There’s some 4000+ people work in that complex (even I used to work there some time back) and for simple reasons, the adjacent road (in front of gate 1 & 2) has become kolkata’s new food lane/ khao gully. One can find items varying from sandwich (done by an ex-Marriott cook) to naan-chilly chicken (with extra gravy) to sweets from nadia and frankly what not. This road maybe needs a separate post sometime, but here we’ll concentrate on the very last shop. you keep on walking down the lane, keep on walking, don’t get disheartened- cross the crowd and suddenly on your left (just opp to the small market complex), you’ll fine lots of tamil and telegu people chatting in front of one small shops (jhoops, as they call it). The jhoops is decorated with telegu movie posters and seems extremely unimpressive. Don’t fear, go there and ask for a chicken biryani (please beware, its of south India variety- WITHOUT POTATO). The guy will get you some rice from a big deg, chicken piece from another- pour sambhar on top (don’t panic please, even on a good day, he might as well ask you for a free second helping for it) and some garlic chutney on side. There’s seating arrangement inside. Settle inside, take the first spoon and start cursing me. I know, its damn spicy. But tell me, isn’t it enjoyable ? Heavily spiced with star anise and whole black peeper, this is like the first love. You don’t know what you’re having, but for the time being, extremely enjoyable. At 35 /- for half plate, a great start. 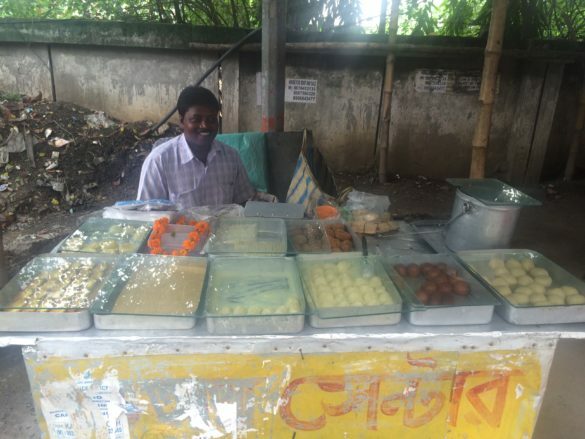 Once you’re through and your tongue is burning, get on the other side of the footpath and you’ll find nimai da’s sweet stall. He sources them from krishnanagar and nadia. Rest are fine, but his gur colored square sandesh is just terrific. At 7/- a piece, take 2 pieces and walk off. Happy, now let’s concentrate towards beliaghata area. I got a partiality for this because I stay here- period. 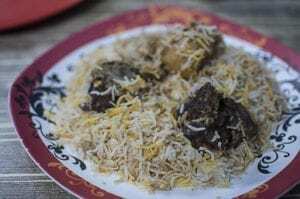 On CIT road, in between phoolbagan crossing and CIT more, there are these jora petrol pumps (two adjacent pumps) and on the oppsite footpath, in front of Nine Hills parlor, lies this hidden gem, Raj Biryani Center. Before you start cursing me again, let me tell you, these guys are making this biryani and maintaining this stall for last 15+ years. 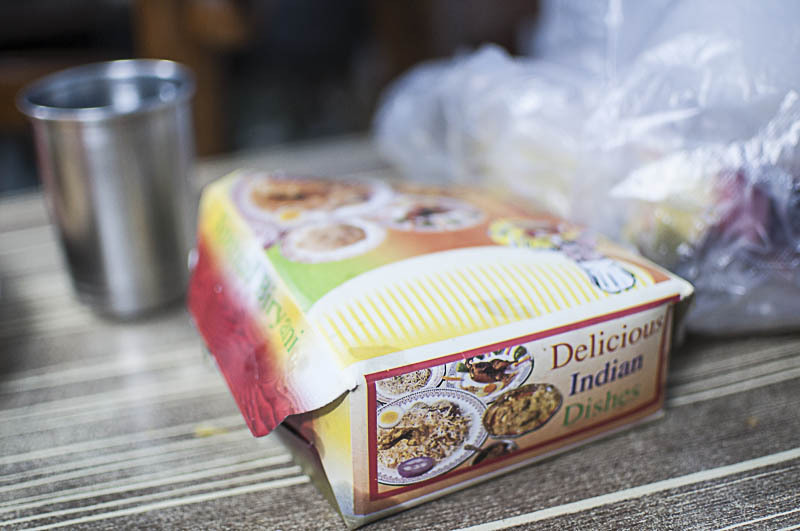 The biryani is slightly uncivilized and subtlety is not their forte. But the good part is they use less rose and kewra water, but still maintain the taste. Statutory warning, keep an eye on the meat piece and you can select your own piece (“dada, ektu sina dekhe din na). 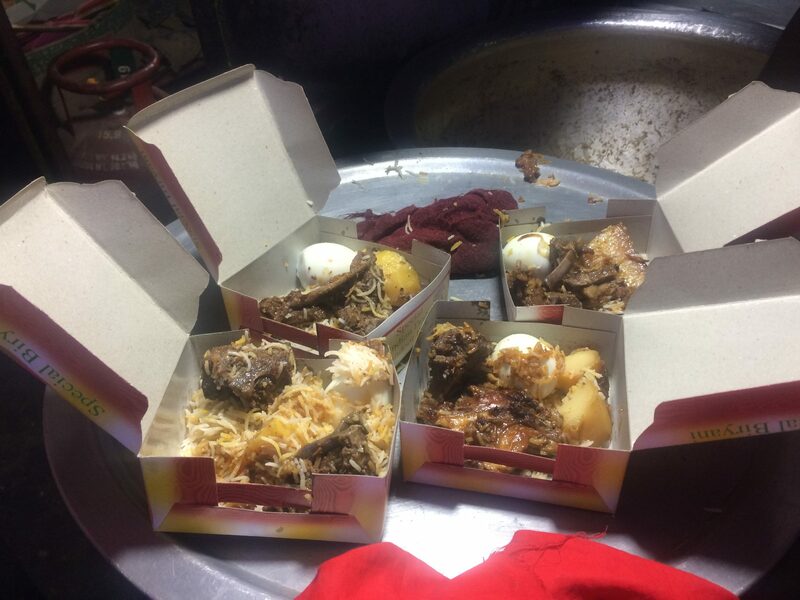 P.S: they offer you 2 medium mutton pieces, one potato and one egg (which I never take)- the simple reason being half plate biryani is also sold here with one piece of meat and on request, they also give some of their mutton kasha gravy with biryani (if you don’t take salad)- take away is recommended from this place. For those who’re staying in south Kolkata, do not get disappointed, we are coming there. Have you been to priya cinema hall, deshapriya park ? Besides, there’s something called bani chakra (the famous musical school) and stellar furnishing. In front of stellar furnishing shop, you can find this small shop selling biryani and this guy doesn’t seem to take rest, such is the demand. This gentleman, Samar da takes his weekend break on sundays and on all other days, brings 2 big handis and shuts his shop down once that’s over. 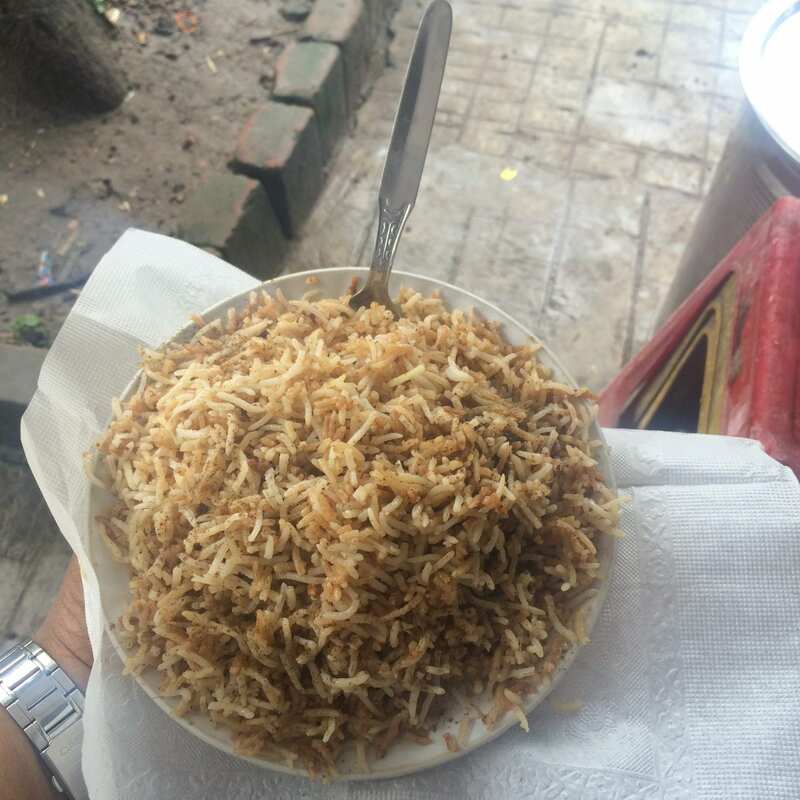 No other item is available here other than chicken and mutton biryani. The USP is the pinch of chat masala and salt he sprinkles over the biryani once served and that makes the difference. Meat piece is generally moist and soft and as for a person like me, half [email protected] 35-40/- (I keep on forgetting the exact amount) is sufficient for a working lunch. Parking is available, hence not to worry. I’m saving the best one for the last. The hidden gem in rajabazar area- Taj restaurant. 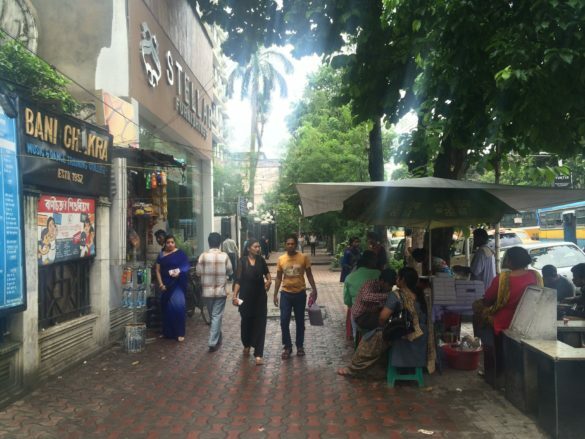 Once you enter keshab sen st from rajabazar crossing towards Amherst st, after a few minutes of walk, it’ll come on your right side. Please DO NOT TAKE YOUR CAR (though 2 wheeler is fine), forget about hygiene (though I’ve never been sick while eating here from last 10+ years) and get in. 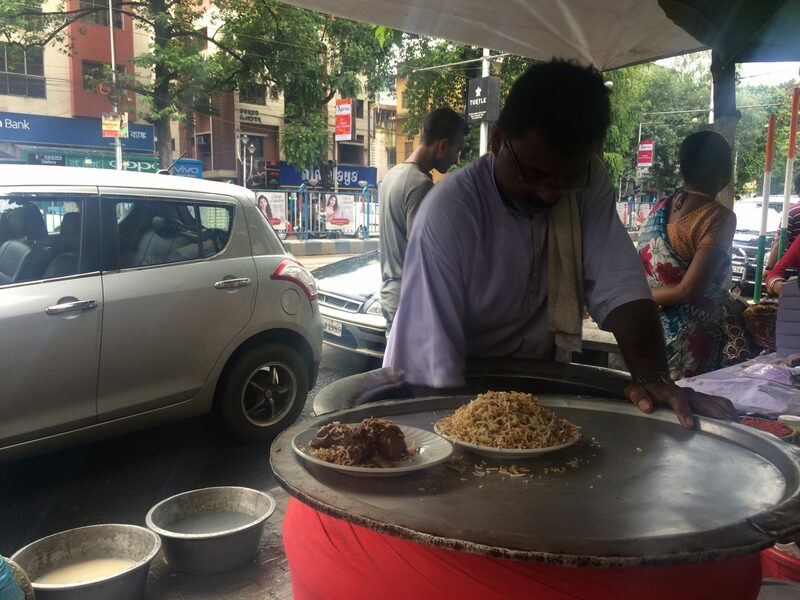 You’ll find a true kolkata styled biryani. Though on a bad day, it tends to get a little spicy, but with long grains of rice and one big, soft, fatty meat piece and potato (might be avoided), hardly anything can go wrong. 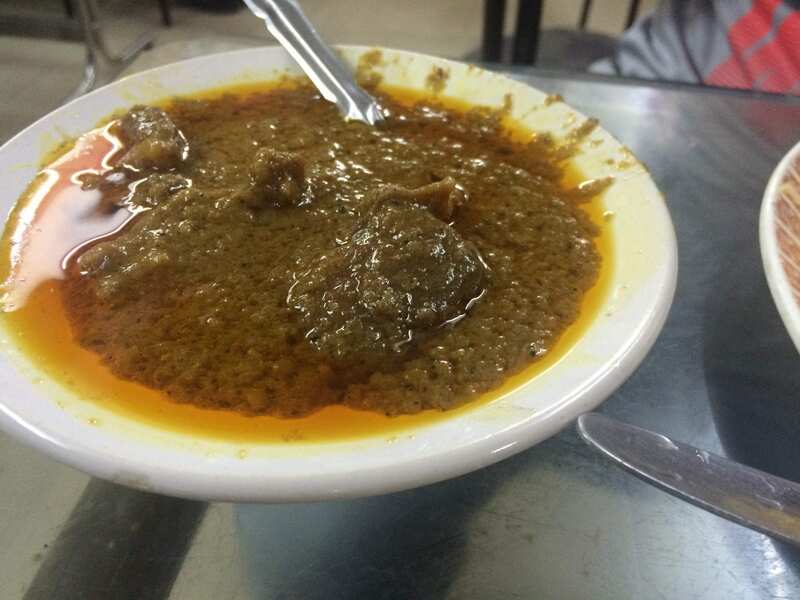 In the breakfast, they make a fantastic mutton korma also. Anyway, coming back to the biryani, I would suggest a full meal here (again, forget about hygiene)/ Start with a piece of chicken fry. 25-30/- for a big drumstick marinated in some strange chicken-65 like masala and deep fried and served to your plate immediately doesn’t sound like a bad deal to me. The next item should be their special mutton biryani with one extra potato piece (because you’ll take your friend along- right) followed by their chicken korma/ kassa and 1 tandoori roti each. Trust me, you won’t regret. I guess, you’re not expecting any fancy seating and service. They boast of an AC, but its mostly non-working. Go there, I don’t think you’ll regret. I am loving the series! DLF used to be my regular haunt as my client Lafarge is located there. I have dined from the food lane many a time but haven’t been lucky enough to find the said gems as I would enter from gate no. 5. If we ever have an opportunity to go there together, I’d definitely like you to take me to this sandwich shop run by the Marriott-returned chef. 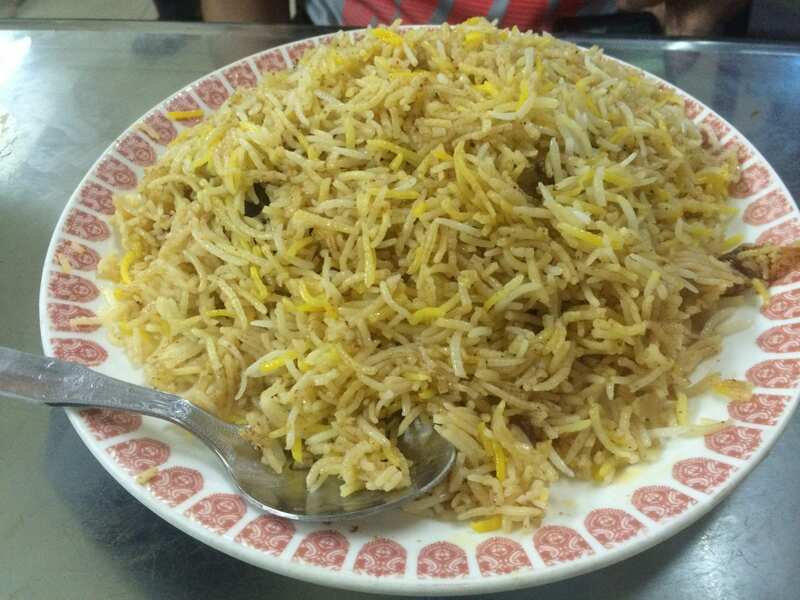 The biryani near Priya cinema made me nostalgic. 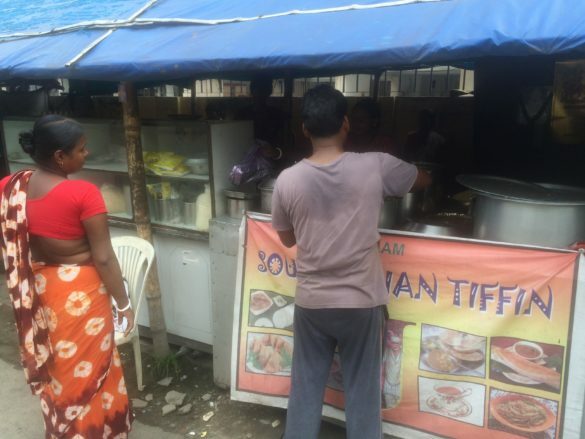 I’ve had biryani from that stall numerous times as my last workplace was located there. It used to be a half plate almost every time as that was filling enough. I can still recall the taste. The gentlemen used to put some salad on the top before serving. 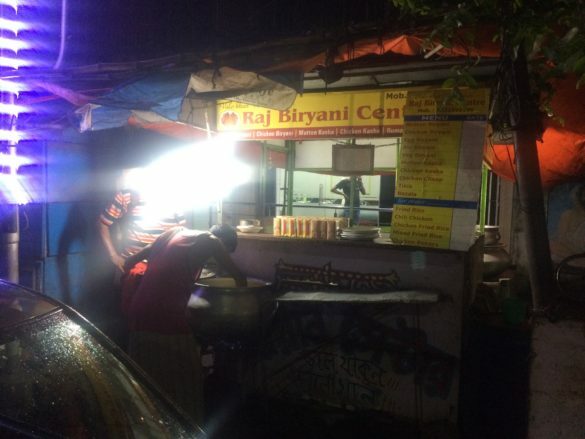 There was a roll shop in the Priya cinema building facing the footpath on Rasbehari Avenue and it would serve biryani as well. 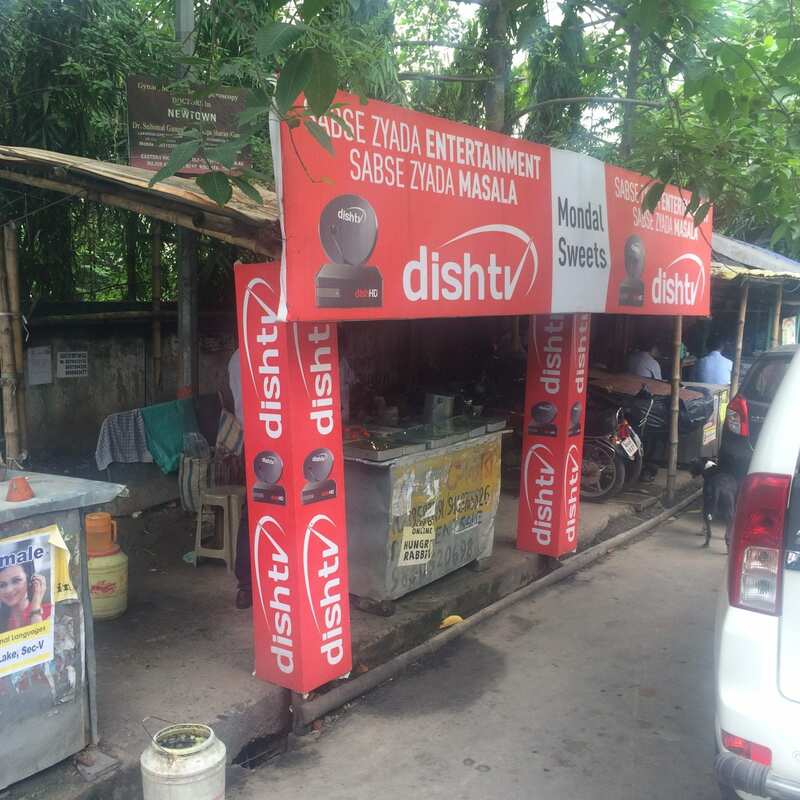 But this shop used to outsell it by a fair margin everyday. Will try soon- where is it ? Aha..bapok..bapok..? ?..pet bhore gelo..? ?..food food everywhere..